Over the course of more than 100 years, Severn has transformed itself, when and where appropriate, in response to the changing educational landscape, while simultaneously maintaining the timeless aspects of its founding principles. Severn is a vibrant, dynamic school in which students have many opportunities to explore, discover, investigate and create across a wide range of disciplines and activities. In 1914, a 28-year-old teacher and his young wife crossed the river from Annapolis to open a boarding school. Rolland M. Teel wanted to prepare young men to pass the entrance examination at the United States Naval Academy. The Teels selected Severna Park (then just a small railway stop in Boone, Maryland) because of its accessibility by train, rural atmosphere, and remoteness from “town life” near the Academy. Less than a month after World War I broke out in Europe, Severn School opened its doors to its first six students. Mr. Teel oversaw many of the improvements to Severn School over the years, always holding to a high standard of character and achievement. Serving as principal (a title later changed to headmaster) for 41 years and chairman of the board for another decade, Mr. Teel continued to teach classes. Under our founder’s guidance, Severn changed from a one-year preparatory course to a four-year college preparatory school. Even while fostering close ties to the Naval Academy, Mr. Teel saw that Severn developed its own character. In the 1950s major curriculum reform broadened the School’s offerings and strengthened programs in English, history, and foreign language. This prepared students for a wide range of college choices. Of course, the School has developed in the years since Mr. Teel. Admitting girls in 1971 and phasing out boarding by 1973, Severn has responded to the needs of the community. The transformation to its present configuration was complete with the addition of the sixth grade in 1978. Susan Ashley Teel upon her graduation from Wellesley College and Rolland Marshall Teel in 1931. Since then, the physical plant has improved greatly. The latest milestone is the opening of the newly renovated Teel Academic Center, featuring a two-story library, the Centennial Rotunda whose interior walls are inscribed with the name of every Severn graduate from the first 100 years, and the Graw Innovation Center where students can explore, design, and experiment with ideas and concepts. Immediately adjacent is Creeden Hall which houses Severn’s Upper School program. The building, named for former Headmaster Bill Creeden and his wife Debbie—a long-time math teacher—features a three-story Foucault pendulum, science labs and prep rooms, a greenhouse, a tiered lecture hall, classrooms, two computer labs, and greatly-needed student space. The Robert E. McCleary Student Center includes Price Auditorium, Bauer Dining Hall, Carpenter Lecture Hall, Upper School art rooms, a photography lab, recording studio, dance studio, computer labs, art studios, and general classrooms. The Edward St. John Athletic Center, which opened in 2008, continues to be a star in Severn’s crown. This 44,000 square foot multi-purpose field house holds basketball courts, a fitness center, teaching and reception areas, and a training center, staff by two full-time. licensed athletic trainers. Meanwhile, down the street in nearby Arnold, Maryland, Chesapeake Academy opened in 1980 by four women: Louise Sivy, Helen Braun, Ethel Rew, and Patricia Troy. They recognized a need for an independent early childhood and elementary program offering small classes and a challenging multi-faceted curriculum. The women had been colleagues at Wroxeter-on-the-Severn School (which closed in 1979), and opened Chesapeake Academy with just 36 students. Classes were held at a space previously occupied, believe it or not, by a beauty parlor. The next year classes were held in a local church before moving to the present location on Baltimore Annapolis Boulevard, just a few miles from Annapolis. In January 2013, the Boards of Trustees of Severn School and Chesapeake Academy each voted to merge the schools, effective July 1, 2013, making Severn a school that extends uninterrupted from preschool through 12th grade. We’ve long enjoyed a mutually beneficial relationship with Chesapeake Academy welcoming many students into our Middle School and sharing many reciprocal agreements. Simply put, the fit was a natural one. The combined Severn School is the largest and oldest independent school in Anne Arundel County. The Arnold location was renamed Severn School Chesapeake Campus. With a rich history more than 100 years in the making, we take great pride in our outstanding team of educators, our comprehensive curriculum, and our extensive array of athletic teams, performing and visual arts, community service opportunities, and co-curricular activities. The Severn School student body and faculty in 1917. 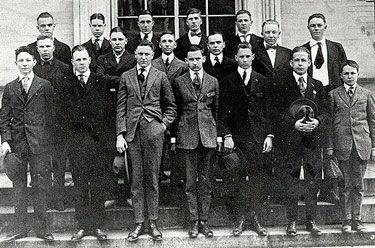 Standing in the center of the second row are Mr. Teel and the only other master, Mr. Albert Hawkins. Together they handled all teaching and administrative matters, while at the same time providing supervision, regular meals, normal hours, discipline, and a solid background for a student body that began with six but soon climbed to almost 20 boys. Founded by Rolland and Susan Teel with only one other teacher, Albert Hawkins. Severn’s maroon and white colors originated from Mrs. Teel’s graduation floral arrangements that included mulberry and snowball combinations from her garden. Severn becomes a four-year preparatory school. “Old Main” building is constructed—known in its later years as Teel Hall. First interscholastic team, wrestling, finishes inaugural season undefeated. The Dining Hall was constructed on what we now call ‘The Little Field.” Three private homes along Maple Avenue purchased to be used as dormitory space. WWII sees Severn alumni in action around the world. 73 lost. Severn adds a “junior school” (grades 7 & 8). Woods Hall is constructed. Albert K. Hawkins becomes Severn’s second Headmaster. Mr. Hawkins retires after 43 years of service to the School. Mr. Paul J. Kesmodel becomes Severn’s third Headmaster. Severn builds Memorial Gymnasium, dedicated as a tribute to the Severn alumni who gave their lives in service to our country. Mr. Joseph A. DiVenuto becomes Severn’s fourth Headmaster. Modern, colonial-style dormitory completed on the banks of the Severn River. Now known as Teel Academic Center. Admiral Alfred G. Ward is named Severn’s fifth Headmaster. Severn goes co-ed, as a small number of female day students are admitted. Boarding is discontinued; dorm is turned into an academic building. James W. Donnelly is appointed Severn’s sixth Headmaster. The Boone House is purchased by Severn School. Teel Academic Center completed, and the original Teel Hall razed. Edson P. Sheppard becomes Severn’s 7th Headmaster. Severn celebrates its 75th anniversary. The Class of ‘89 buries a time capsule beneath the Boone House water mill. William J. Creeden becomes Severn’s 8th Headmaster. On Homecoming Day in October, the School breaks ground for the new Student Center adjacent to Teel Academic Center. The center is dedicated in April, 1999. The Alumni Walkway, the central passage through campus, is dedicated to all Severn School alumni. Ground is broken for the new Upper School Academic Building on what was known as the Sackett property. The building is dedicated in 2002. Severn celebrates its 90th year; Severn wins National Fed Challenge competition. The Upper School Academic Center is renamed Creeden Hall in honor of Bill and Debbie Creeden. Douglas H. Lagarde is appointed Severn’s 9th Headmaster. Ground is broken for the new Edward St. John Athletic Center. Edward St. John Athletic Center opens. Severn wins the Interscholastic Sailing Association Fleet Racing National Championship and brings home the Clifford D. Mallory Trophy. Two synthetic turf fields are completed. Construction begins on an Outdoor Environmental Center behind the Academic buildings on the Teel Campus. What eventually becomes the Stine Outdoor Education Center now boasts a tiered outdoor classroom, trails, a counsel ring, challenge course with low ropes to promote team building, and an artist's reflection area. Severn School and Chesapeake Academy merge. Chesapeake Academy is renamed Severn School Chesapeake Campus. Severn celebrated its Centennial with a year-long slate of events, culminating with The Big Party in May. June marked the graduation of the 100th Severn School class, and the groundbreaking for the new portion and significant renovation of Teel Academic Center. The School dedicates the newly renovated Teel Academic Center featuring a two-story library, the Centennial Rotunda whose interior walls are inscribed with the name of every Severn graduate, and the Graw Innovation Lab where students can explore, design, and experiment with ideas and concepts.